NEW YORK, March 8 (JTA) — A defining moment in the life of Max Fisher, the son of immigrants who became a Jewish icon, came in a meeting with former President Eisenhower in 1965. As head of the United Jewish Appeal at the time, Fisher met Eisenhower to ask him to address the UJA on the 20th anniversary of the liberation of the Nazi concentration camps. But during that meeting, he learned he would change history. Eisenhower told Fisher he regretted forcing Israel out of the Sinai when he was president during the 1956 Arab-Israeli War. “Max, if I had a Jewish adviser working for me, I doubt I would have handled the situation the same way,” Eisenhower is quoted as saying in Fisher’s biography, “Quiet Diplomat,” written by Peter Golden. “That’s the day that Max figured out what he was going to do. He wanted to be that adviser,” Golden told JTA in a phone interview. Fisher, about whom superlatives are routinely used to describe his power and leadership in the American Jewish community, died March 3 at his home in Detroit. He was 96. He was buried in Detroit on Sunday, with a reported 1,300 people attending the funeral. Hours after his death, e-mail messages made the rounds of major Jewish organizations and activists to alert them of the death of a man who not only led many major Jewish organizations but also exercised enormous political power, personally advising Republican presidents for nearly half a century. “The State of Israel has lost a true friend, who was one of its greatest supporters,” Israeli Prime Minister Ariel Sharon said in his Cabinet meeting Sunday. “To a large degree, it is due to Max Fisher’s activism that approximately 1 million new immigrants came to Israel from Ethiopia and the former Soviet Union in the 1990s,” he said, referring to Fisher’s work to prioritize aliyah for the Jewish Agency for Israel after the fall of the iron curtain. “I dubbed him the ‘dean’ of the community, and he certainly was until his last day,” said Malcolm Hoenlein, executive vice chairman of the Conference of Presidents of Major American Jewish Organizations. Fisher had been honorary chair of the UJC. In the world of Jewish volunteer leaders, Max Fisher was a “giant,” Rieger said. For Jane Sherman, one Fisher’s five children, the outpouring was overwhelming. “I got a call from Israel. They wanted to bury him on Mt. Herzl,” the site reserved for Israel’s most celebrated heroes, she said. The family declined. Many Israeli dignitaries called to offer condolences, along with Presidents George H.W. Bush, George W. Bush and Gerald Ford. “We didn’t only lose a father,” said Sherman, co-chairwoman of the Israel Department of the Jewish Agency. 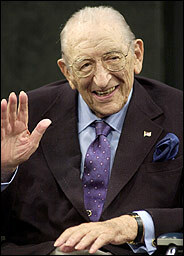 Fisher was the founding chairman of the Jewish Agency’s board of governors. “He was a role model for us as well as the rest of the world,” she said. Fisher was born in Pittsburgh on July 15, 1908 to Russian immigrants. The family soon moved to Salem, Ohio, where Max was one of the few Jews in town. He attended Ohio State University on a football scholarship; he played linebacker. Fisher earned his wealth in oil and real estate. Last year, Forbes valued his fortune at $775 million. The magazine ranked him at 383 on its list of the 400 richest people in America. He was also the oldest. Those close to Fisher speak in near-mythic terms of his humility and his ability to mentor and lead communities — essentially, to speak softly and carry a big stick. “He was the ultimate leader,” said Robert Aronson, CEO of the Jewish Federation of Metropolitan Detroit, where Fisher served several years as president. But Jewish philanthropy was his main charitable mission. Even as much of the Jewish community struggled to emerge from the shadow of an immigrant culture, and often was excluded from elite society, Fisher already had made it. None other than the son of Henry Ford, known for his anti-Semitic beliefs, became one of Fisher’s best friends — and eventually a major contributor to Detroit’s Jewish federation, said Joel Tauber, a Detroit resident and friend of Fisher’s for 40 years. “He was the leading Jew in North America,” said Tauber, noting that Fisher at different times led the Jewish Agency for Israel, the United Jewish Appeal and the United Israel Appeal. After the Holocaust and the storms surrounding Israel’s creation, he, Fisher and others were hungry to rush to Israel’s aid, Tauber said. “When anything involved Israel or the safety of Jews, we were like fire horses. We heard the bell, and we ran,” he said. Israeli Vice Prime Minister Shimon Peres issued a statement on Fisher’s death. “Max Fisher was living proof that the American Dream was the continent’s reality. From humble beginnings, he created an empire. And as soon as he built his wealth, he began to share it. He lived by the dictum that wealth created should be wealth given away,” Peres said. The organized Jewish world was never the same after Fisher spearheaded UJA efforts, Peres said. Matthew Brooks, executive director of the Republican Jewish Coalition, which Fisher founded in 1985, echoed those sentiments. “The reason we are here today and the success we are seeing has a direct lineage to the vision he saw many decades ago. When he gave advice, people knew not only that the advice was correct, but there were no other hidden agendas,” Brooks said, noting that Fisher never took an ambassadorship or other government perk. Those who had the chance to work with Fisher valued his loyalty, his access and his personal philosophy — patience and persistence. For example, when Tauber chaired the original committee for the rocky merger of the Council of Jewish Federations and the United Jewish Appeal, Fisher stood by him when others attempted to derail it, he said. “He’s just very tenacious,” Tauber said. Former U.S. Secretary of State George Shultz said he met with Fisher frequently, and worked with him to help organize a “soft landing” for Israel’s inflated economy in the 1980s. Shultz remembered Fisher leading a delegation of 100 American entrepreneurs to Israel to consider buying Israeli products and locating factories there. Fisher always made his agenda clear, and made room for those who could further it. Shoshana Cardin of Baltimore is a veteran Jewish leader whose politics usually were Democratic. Still, Fisher would invite Cardin to State Department dinners because he thought she could advance their common cause. Cardin marveled at Fisher’s dedication and access, noting that presidents took his calls immediately. Yet Cardin said she was surprised to learn from his assistant that when Fisher was in Israel for business he often ate dinner by himself in his hotel room. He didn’t get many dinner invitations, she was told, so she invited him to join a group of friends one night, and he joined them with pleasure. Cardin surmised that others were intimidated by Fisher, or simply assumed he would be busy with loftier engagements. In his absence, the Jewish community will experience the loss of a colossal mentor and father figure, she said. No other senior adviser is as respected as Fisher by so many people, both in the United States and in Israel, she said. If someone had a problem, he or she “could go to Max, and Max could help straighten it out. “There is no Max who can do that now. There is no one who could take his place,” Cardin said. Howard Kohr, executive director of the American Israel Public Affairs Committee, said Fisher was the consummate networker, always making sure people got in touch with the people Fisher thought they should know. “If you look over the history of the U.S.-Israel relationship, it’s hard to find a single private individual who had a greater role on behalf of the State of Israel than Max,” Kohr said. Former U.S. Secretary of State James Baker called Fisher an “extraordinary friend” who was a major force in the Republican Party. Fisher was “plugged in,” Baker said. American presidents and secretaries of state wanted to talk to him because he was talking to the Israeli players, and Israeli prime ministers worked with him because he was speaking with American leaders. The relationships also were personal. When Fisher fell and broke his hip a year ago, he received phone calls from three presidents — Gerald Ford, George H.W. Bush and George W. Bush. When Fisher entered a room, the head table became wherever he sat, said Rabbi Israel Singer, chairman of the World Jewish Congress. Fisher, whose first wife, Sylvia Fisher, died from rheumatic heat fever, is survived by his wife, Marjorie Fisher. He is also survived by Jane Sherman, the only child of his first marriage; his second wife’s children, Mary Fisher and Phillip Fisher, who he adopted; and Marjorie Fisher and Julie Cummings, daughters of his second marriage. He is survived by 14 grandchildren and 10 great-grandchildren.